"The ultimate wallet for all your card and card trick needs. If you need a fully functioning, handsome wallet that holds a poker sized deck of cards and your favorite packet card tricks, you might need something like Precision Magic's Professional Card Wallet. Developed for magicians by magicians. Precision Magic's Professional Card Wallet finally gives you an organized alternative to carrying your cards, along with your credit cards, driver's license, business cards, or other necessities. Pull on the Tab and Your cards are delivered into your hands! Flip the case on its side and the back opens up to 6 plastic holders for packet tricks. 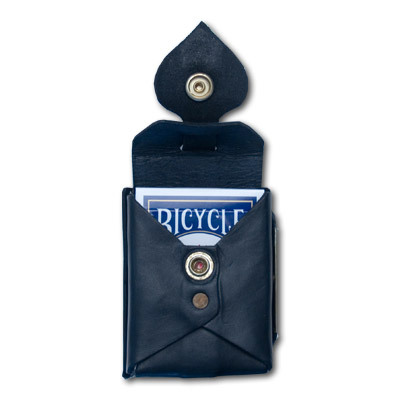 Precision Magic's Professional Card Wallet measures just 3 inches wide and 4 inches long when closed. Very handsome quality leather with brass hardware to keep everything safe. Quality Guaranteed!" Please Note: Cards are not included. Simply enter your details below and we will send you an e-mail when “Card Wallet by Precision Magic (discontinued)” is available to ship!